Landowners Vow to Appeal Grain Belt Express Decision: Click here. "Clean" Line Energy Partners Calls it QUITS. For the real scoop: Click here. and was dismissed with prejudice by the Illinois Commerce Commission on June 15, 2018. Order on Remand, Click here. to everyone who contributed time, talents, and funds in this long but critical battle for landowner rights. Bravo. 3/13/18 Word just in that the 5th District Appellate Court has reversed the ICC's approval of GBE! The Court ruled (1) that a nonpublic utility applicant (GBE) may not use the Expedited Review process of the Public Utilities Act, and (2) GBE does not meet the definition of a public utility. For a link to the Order, click here. A reminder: In the 3rd District Appellate Court Order delivering a death blow to RICL, there were a SUBSTANTIAL number of issues with the ICC order that were never ruled on because they simply, first, weren't a public utility. There would STILL be SUBSTANTIAL hurdles besides simply qualifying as a "public utility" should "Clean" Line ever come back and try again in Illinois. a "could, would, maybe, might." and the IL Supreme Case is OVER. Details here. MANY similarities to "Clean" Line projects that you could almost just substitute project names. WOW. Watch to the end. WOW. Click here. Dear RTO Insider, Crain's Chicago Business, and any other trade paper being lobbied to do puff pieces on "Clean" Line. Please do your OWN research. here can be a helpful place to start. BRAVO!! Missouri PSC DENIES GBE FOR THE THIRD TIME! and more details as they become available! "Clean" Line has played a significant role in exposing true costs and in the backlash against Big Wind. Read here. Read here. Nope, we're not surprised. July 4th update in Missouri! Hint: Jump ahead to 25:52 to hear the clear and concise arguments! RICL significantly downsized and failed to notify the IL Supreme Court. IL Supreme Court Oral Arguments scheduled for May 17, 2017. BRING IT ON! Refresher on Appellate Court ruling: Click here. briefs filed on April 12th! It just doesn't get much clearer than this. Thank you to EVERYONE who contributed their time, talents, and hard-earned money to stand up for what is right! Update on the MO PSC Hearing. Click here. "Clean" Line projects! Click here. You know, that pesky stuff gathered under oath and not from salesman/lobbyist's spiel or "Clean" Line's fluffy PR. Happy New Year! RICL has officially pulled out of Iowa, but the IL Supreme Court case is full speed ahead. Link to Iowa Utility Board document: Click here. An EXCELLENT, must-watch video on what's really wrong about "Clean" Line projects and talks about TRUE costs. Click here. IL Supreme Court to Hear RICL Appeal. Thank you to the reporters contacting us! Thank you, Chicago Tribune and Becky Yerak. Critical Missouri PSC meetings coming up! Click here and here for the schedule. "Answer to the Petition For Leave To Appeal"
ComEd's opposition is just "sour grapes,"
needs to read this Answer and the attached testimony. Click here. to the U.S. Department of Energy and the attempted use of federal eminent domain through Section 1222. Great article in the Earlville Post! The Illinois 3rd Appellate Court has ruled that the Illinois Commerce Commission erred in granting Rock Island "Clean" Line public utility status, and, IN A 3-0 UNANIMOUS decision, reversed the ICC order!! Read the Court Opinion here! Block RICL Press Release here! For more information on the legal victory from Illinois Landowners Alliance attorneys: Click here. For more information from Block RICL, go to our Facebook page by clicking on the Facebook tab. "Clean" Line DROPS THE GUISE OF "CLEAN" !! Great, great read: Click here!! Fantastic read on "Clean" Line tactics. Click here. Be sure to click on the link and READ "Clean Line's counsel says they meant to do that." Meanwhile, in Iowa at the IUB…….. Click here. Why the latest Missouri "Landowner Protections"
are a Crock. Click here. Grain Belt Express. Click here. Arkansas Landowner Catches "Clean" Line Contractors in a Web of Lies. Click here. "Clean" Line, err….um, "promises" local jobs, but hires Texans. Click here. A fun (yet succinctly ON-POINT) read! Click here. Wall Street Journal LTE. Click here. "Involuntary Cotenants: Eminent Domain and Energy and Communications Infrastructure Growth"
Click on title for link to "Involuntary Covenants"
from the LSU Journal of Energy Law and Resources…..and "Clean" Line projects aren't necessary "infrastructure," but that's another post! Clean Line Decision. Click here. The Department of Energy's "Landowners Benefits" Ruse. Click here. Definition of Insanity. Click here. Condemn Private Property. Click here. Landowners to DOE: See Ya in Court. Click here. For more information, please visit our Facebook page by clicking on the tab at the bottom right of the page. Here's the response. Click here. tactics, and business plan. Click here. "Clean" Line's latestactivity on their projects! Clean Line Energy wins the "Eye Roll Olympics"
The Iowa Utility Board has DENIED RICL's third request for bifurcation! Congratulations Iowa!! Read the IUB Ruling: Click here. Carolyn Sheridan outlining major points: Click here. We are deeply appreciative of the Iowa Utility Board decision which clearly upholds the law and very carefully considered constitutional rights. Video Message from Iowa: Click here. Open Letter to RICL from 23 Iowa Representatives. Bravo and THANK YOU! Click here. Dec. 2nd IL Block RICL PRESS RELEASE: Click here. Windward Iowa funded by "Clean" Line: Click here. Many thanks, NPR Radio for a well-researched report! Then pay attention to the ever changing numbers Amy Kurt stumbles over. BRAVO to the IL Appellate Court Appeal Team! Oral arguments were heard on Dec. 1st in Ottawa. Click here for a quick summary. New great LTE in the St. Louis Dispatch. Click here. And another from Nov. 28: Click here. And another new, must-read LTE in AR: Click here. BLOCK groups across the Midwest are having very, very busy weeks!! Please go to our Facebook page for our many updates and press releases! Word of Caution to the Press! When the Illinois Commerce Commission ruled on RICL last November, NO ONE but the ICC knew the details of what was in the Final Order when RICL was "approved" by the ICC. The actual order (several hundred pages) was not released at the same time as the ICC meeting. Yet, "Clean" Line press releases touted a win, but omitted "small" details like the ICC also voting unanimously that RICL did not prove NEED, had to prove that all financing was in place before building, needed Iowa regulatory approvals, or were denied eminent domain. By the time these details were known, the stories were over and these important details failed to be reported. NEW: IL Appellate Court to Hear Oral Arguments on RICL: Click here. For information on the initial Appeal filed in February: Click here. Stay tuned for Block GBE press releases on today's expected ICC ruling. Oct. 27, 2015 Update: GREAT letter to the DOE from Senator Tom Cotton!! Click here. Arkansas Congressional Delegation sends letter to the Dept. of Energy Sec. Moniz. Click here for the questions we're ALL waiting for! There's been many new updates lately and details are posted on our Facebook Pages!! Click on the Facebook tab bottom right side of this page to read the latest posts. A HUGE thank you to our great volunteers going the extra miles!! MISSOURI PSC TURNS DOWN "Clean" Line's GBE! The final vote and order is IN!!!!! Illinois Landowners Alliance: Click here. IL Farm Bureau/IL Ag Association: Click here. read the ILA Press release and the Applications for Rehearings submitted to the ICC. All are linked below. GREAT news coming from Iowa! Click here. WOW! The Oklahoma Attorney General weighs in on "Clean" Line's Plains and Eastern project. This is pure gold: Click here. BRAVO! Here's a blueprint for townships, counties, and states being courted by "Clean" Line! have to "negotiate" with "Clean" Line!! This is a must-read! Click here. Bravo, Block Plains and Eastern!! Click here. Thanks to all of reporters checking out what has come out UNDER OATH and not from the company's PR firms!! Go to the Block GBE tab above. For more Illinois news, scroll down this page. A.K.A. "Clean" Line's Very, Very Bad Week. RICL has SIX lobbyists registered at the Capitol. Go to the Iowa website for more info: Click here. Welcome, BLOCK Grain Belt Express- Illinois! Also click on the Block GBE tab above. was on the ICC docket and what landowners were originally notified would be on the route! Click here for the list of parcels included on the docket. Click here for the route maps and legal description. If/when they go to the ICC to try again for eminent domain, these sorts of tactics wouldn't be in their favor.... at all. 1. Illinois Landowners Alliance (ILA): Click here. 2. Farm Bureau: Click here. This is a groundbreaking case through which future case law and precedent will be set. We deeply appreciate all of the intervening parties efforts in protecting ALL of our futures against a private, for-profit LLC's attempts to side step and bend existing laws written for the public-serving public utilities. Yes, the ICC Order gives RICL the right to survey, but there are MAJOR things you need to know. Do NOT sign anything from RICL and attend the Farm Bureau informational meeting. It's likely that RICL would be asking you to sign away MORE rights than the very, very basic "soft survey" rights given in the ICC Order- Get informed and protected! Even the "soft survey" (visual only, no vehicles, no core borings, etc.) are being contested at the ICC. The IL Commerce Commission (ICC) Final Order is in! Click here for the full 200+ page order. "According to Staff, Rock Island essentially concedes that no need for the proposed Project has actually been established." Click here. Just how RISKY and SPECULATIVE is RICL? Click here. RICL was denied under Sections 8-503 and 8-509 which would put them on the path to eminent domain. Since the judge in his proposed order clearly stated that RICL failed to prove need, (RICL argued they didn't have to), this could be a critical point if RICL were to try to petition again for those sections, and therefore eminent domain. Mendota Reporter- ICC releases ruling: Click here. FarmWeekNow- ICC grants RICL conditional permission: Click here. AgriNews: Headline withheld because it is WRONG! Click here. RICL does NOT have construction to build. They have to go back to the ICC and prove they have $2 Billion in hand, PJM Interconnections in place, MISO and PJM studies done, etc. etc. Read a blog about RICL's premature press release: Click here. Landowners can say NO. GO. AWAY. There is some surveying rights, but there's lots you need to know before allowing RICL on your land! If land agents try to say RICL is a "done deal" and they'll just come back with eminent domain, they would be very, very wrong. CONGRATULATIONS!!! And thank you to all of our volunteers who worked tirelessly and unselfishly on behalf of all of our land, income, investments , family legacies, and property rights!!!! Press: Thank you to all the reporters contacting us for inormation! Email SaveOurFarmland@hotmail.com if you have not yet received our press release. Thank you! finally identifying problems with Grain Belt Express and "Clean" Line's projects. Click Here. Yes, RICL has filed at the Iowa Utility Board. NO!! It is- by far- NOT a done deal! and on Block RICL and Preservation of Rural Iowa Facebook pages. applies to both RICL and GBE. It can't get much clearer than this. These are succinct and interesting reads! ILA Reply Brief on Exceptions: Click here. Farm Bureau Brief on Exceptions: Click here. ComED Reply Brief on Exceptions: Click here. The Effects of Ground Voltage or Stray Current on Infrastructure Caused by HVDC Transmission Lines. THIS IS, BY FAR, NOT A DONE DEAL, but it doesn't stop RICL from spinning more spin. Reporters and landowners don't be duped by RICL salesmen and land agents. Click here. Click here for a link to the ICC proposed order which was likely be revised before going to the full commission. Click on the Facebook tab bottom right for updates as we get them. Read a commentary about the order: Click here. U.S. Department of Energy Secretary Ernest Moniz. Click here to read a spot-on letter to Sec. Moniz. what you're missing! No account needed. It is a great privilege to work with so many dedicated, sincere, and talented people collaborating on a common goal. You are an inspiration to us and others! Check the Facebook page often! There's small victories and breaking news almost every day! 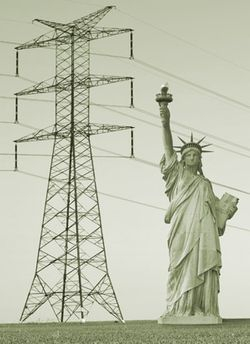 Independent analysis of HVDC health risks! Great explanation of why "Clean" Line's Tactics have drawn broad, Midwest-wide opposition: Formal Complaint to the MO PSC. The Missouri Landowners Alliance! Click here to read! "RI emphasizes its ability to use eminent domain powers as a marketing point with its "potential" lenders and investors." Eminent domain does NOT exist for PRIVATE companies to force PRIVATE individuals to "sell" PRIVATE property rights just so that PRIVATE individuals can ATTRACT lenders and investors. That is WRONG. WRONG. WRONG. Click the Facebook button on the lower right side. No account needed. Read the full Initial Briefs for Illinois Commerce Commission Docket 12-0560 for "Clean" Line Energy Partners, LLC submitted Jan. 31, 2014. This is the staff's recommendation to the administrative law judge. Judge Jones, in turn, will make a recommendation to the 5 judges on the commission. Initial briefs from all parties were due on Jan. 31st. Stay tuned as we are able to post more! "The Other Side of "Clean" Line"
have successfully concluded in Springfield, IL! Excerpts are being posted on the Facebook page and on the Ridiculous RICL Blog! Full transcripts are also being posted on the ICC e-docket. See out testimony highlight page for links. MAJOR, MAJOR issues with the project were identified. Again, the EARLIEST we could expect an ICC decision is well into 2014. MISSOURI: Now is the time to make your voices heard! Go to the Block GBE tab above and visit www.BlockGBEMO.com. Click HERE. ILLINOIS warning: RICL land agents are ignoring the formal notices sent to them requiring all correspondence being through the US mail. AND KNOW NOT TO SIGN ANYTHING FROM "CLEAN LINE"
IOWA warning: RICL land agents are saying that the project has passed in Illinois. That is not correct! The EARLIEST we can expect a decision for the IL portion of the route at the Illinois Commerce Commission is at least April or May, 2014. They face fierce opposition because this project LACKS MERIT and their kool-aid sales pitches DO NOT HOLD UP TO SCRUTINY. There is unprecedented opposition from the Illinois Landowners Alliance (representing almost half of the IL route), the IL State Farm Bureau, and ComED which is the company that RICL has to go through to plug into the PJM grid. ComED's witness Naumann is one of the top experts in the world and his testimony is well worth the read!!! For links, go to the testimony tabs above. The IOWA LEGAL process is different from Illinois, and we are about a year ahead of you in debunking the kool-aid sales pitch. Please click on the Iowa Block RICL tab above for more specific legal information. However, we hope that you can benefit from our key points (not all directly related to Iowa) and the Illinois Commerce Commission testimony highlights where MAJOR concerns about the LACK of expertise, finances, planning, and plain-old, common-sense merit is testified to by expert witnesses. There is MAJOR opposition to RICL because of the lack of merit in this project. Plain and simple. Thank you to ALL who helped make the 2nd Round Illinois Forum a resounding success! If you were in the fields, don't worry. We had it covered!! Click here for the new handout on how RICL is NOT, NOT, NOT, NOT, NOT "like Ameren or ComEd." To read "Clean Line Fails in Mendota," click HERE. Local reporters estimate more than 700 people came to the first forum! Landowners who had driven from as far away as the Mississippi were turned away. The auditorium was packed and the parking lot full. To read lots more posts about the forum, click on the big Facebook Button on the bottom right. There's a couple you don't want to miss! New, updated "Things you should know" flyer available HERE. Illinois Commerce Commission (ICC) Testimony Highlights: Click on tab above. MISSOURI- Click on the Block GBE tab above. IOWA- For the Preservation of Rural Iowa Alliance Click above. The simulation is based on RICL's Illinois Commerce Commission application, easement contracts already handed out, past statements of RICL reps, and standard construction procedures. Click here. Hint: This is a big file. If you have slower internet, you may need to give it some time to download! Illinois Commerce Commission: The testimony on Docket 12-0560 is valuable for ALL projects! For the ICC documents Click Here. Hint: Start with June 25th ComEd and ICC staff testimony. Click here for highlights as we continue to post them. Uh-Oh. BUSTED. RICL's finances....or lack of..... Click Here. "Q: Has RICL demonstrated that the RICL Project's benefits outweighs its costs so that, on net, it is expedted to be beneficial to Illinois consumers? So all that propaganda touted by Detweiler, Connely, Doug Jones, Cottler, etc. in the last 3 years was based on ONLY possible (and in-your-dreams) benefits with NONE of the costs figured in. Makes you wonder what else they haven't exactly been "forthcoming" about. IOWA Alert: We have a new page specifically for Iowa here. LAND AGENT BEWARE!! Have you received a certified letter asking you to meet with Mike Knox? Here's your reply in Illinois: Notice to Deny Right of Way. Sign, copy, and mail certified to Patton. This is a PRIVATE company. You do not have to meet with them until and only IF they become a public utility. IF, and it's a huge IF. Read our Land Agent Beware here. Instead, contribute to the legal fight through the Illinois Landowners Alliance (ILA) to deny "Clean" Line public utility status, and therefore eminent domain. 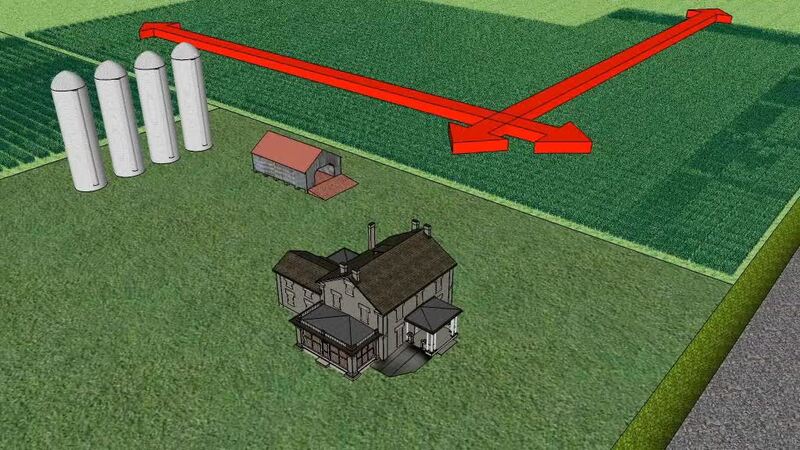 To be referred to ILA, contact us at SaveOurFarmland@hotmail.com. The AIMA (Agriculture Mitigation Agreement) DON'T BE DUPED: Hans Detweiler is making grandiose claims that an AIMA (Agriculture Impact Mitigation Agreement) has been reached with the Illinois Dept. of Agriculture. What took so long? Read more here. From the Illinois Dept. of Agriculture: This does NOT consitute an endorsement of the project in ANY way. See their letter sent to landowners here. Where else would it be okay for a private company to use eminent domain to cut a swath through the middle of a privately owned factory, put up major obstructions in the production line, and think it's okay to pay less than market value for the property in the easement only? Block RICL, originated in northern Illinois, but now stretches across the midwest in a networks of friends, neighbors and families. We are joining our talents and resources to oppose "Clean" Line Energy Partners, LLC projects- including Rock Island "Clean" Line, Grain Belt Express, and Plains and Eastern, in addition to other unnecessary transmission line projects that are being proposed in the midwest - at the cost of billions of dollars to the taxpayer and consumer. "Clean" Line Energy Partners, LLC, expects us to believe that this project would make our electric prices go down. By what creative accounting can that be even remotely possible when “Clean” Line’s own power point presentation states that the estimated cost of delivered wind is $70 per megawatt hour- including $25 per megawatt hour in transmission cost- when our current electric prices are around $30 per megawatt hour??? Add YOUR voice to our ongoing BLITZ campaign until Illinois calls a moratorium on all new transmission lines. ONLINE Petition: Click, sign, and send to all your friends, family, and neighbors!! "We are calling for a moratorium on ALL new transmission line projects in Illinois until we can evaluate ALL lines collectively to assess the actual needs, benefits, and especially the COSTS to Illinois landowners, taxpayers, and consumers." RICL (parent company "Clean" Line Energy) is a private company intending to use eminent domain to build a 500-mile high-voltage DC power line near homes and through prime Illinois and Iowa farmland. The 200-foot easements alone would take over 12,000 acres and impact thousands more in the building and maintenance of these structures and future additions to easements! Representatives of RICL claim that they are not "currently" applying for eminent domain in IL; however, they neglect to say that IF RICL receives public utility status, then being granted the right of eminent domain is basically procedural. The towers would be up to 200 feet tall - or higher - per plans submitted to the ICC. The Statue of Liberty is 150 feet tall.